There were no plans to go home for Dussehra initially. My parents were to join us in Bangalore for Pooja, but the plans went for a twist as the pooja came closer. 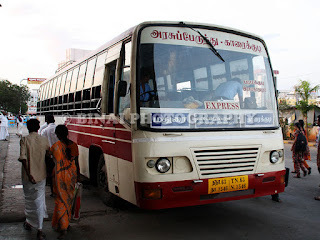 As it got confirmed that we had to go home for Pooja, and in fact reach there for Durgashtami itself - tickets were being sold at a premium - and I decided to stick to Karnataka SRTC - for two reasons - one, their fares were the lowest, two, they offered a late departure, which suited us the most. The return was booked with a private operator - we were returning on Saturday night, and options were aplenty. Quite unusually, I managed to leave office on time, and got home well in time to get ready before TW returns from office. TW ended up a little late, and we had to hurry - hurrying out of home is constant, irrespective of how well we plan! We left home a while after 1930hrs, hurried out to the nearest metro station. We missed a train just as we entered the platform - the next one came 8 minutes later. We had to be quick to get a seat - TW managed to grab 'em for me. The metro has turned into a saviour for thousands of people - its cheap, predictable and reliable! We got to Lalbagh by 2040hrs - for some reason, getting an Ola/Uber auto from there to Shantinagar is always a mess - the regular auto guys rip off, as well. We got one from Ola by 2049hrs, and got to Shantinagar by 2100hrs. The first stop was the A2B restaurant - for our dinner. Post dinner, we returned to the bus station, and began our long wait for the bus. I went around the bus station to find if the bus was parked anywhere, and found the bus parked, a Scania Metrolink coach, at the rear end of the queue. The message containing details of the bus came only around 2145hrs, and we boarded the bus only around 2200hrs - we were still in the middle of the queue, confirming that we wouldn't depart on time. The bus finally got moving from the bus station at 2215hrs - 15 minutes behind schedule. I was quite tired, and looked forward to sleep soon later. The bus stopped at Dairy Circle to pick up passengers (2226hrs) and continued towards Madiwala. We reached St. John's bus stop, Madiwala by 2231hrs - boarding took its time, as usual. We got moving from there by 2235hrs. I dozed off soon later, and woke up just as the bus stopped for pick-up at Electronic City (2305hrs) - boarding took quite some time here - started from there only by 2312hrs. I had another round of sleep as we departed from there. The driver did lug the engine a bit - the bus wasn't very fast. I got up again as the lights were turned on - as the bus stopped at Hotel Saravana Bhavan Classic, Kurubarapalli - at 0017hrs. I got off the bus, as usual, had a stroll, used the restroom and returned back to the bus. Interestingly, the dashboard gave out a lot of error messages, and the odometer reading was blank! The bus also had a modified front door - the door opened inwards (inswing) instead of the usual out-swing door in a Scania. We started from the hotel at 0039hrs. I had a nice long sleep after that. Woke up as the bus stopped at Palakkad bypass to drop passengers (0554hrs). The roads after Palakkad were in good shape - there was no block at Kuthiran, and the roads in the ghat section was resurfaced as well. 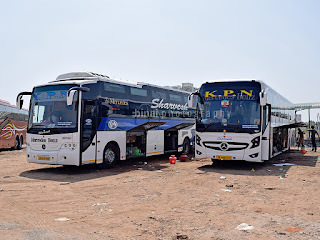 We got to Mannuthy by 0702hrs, East Fort by 0709hrs, Sakthan Nagar by 0714hrs and finally stopped outside the KSRTC bus station in Thrissur by 0716hrs - about 26 minutes behind schedule. The driver actually turned off the air conditioner and began shouting out Thrissur - and, majority of the bus emptied here as well. Remarks: The bus, KA-57-F-1640 homed at Bengaluru-4 depot, was in quite a good shape. The odometer reading was blank, and the screen showed a plethora of error messages all the time. The ride quality was smoother than the usual ACC Scania ride - its usually bumpy in KaSRTC's Scanias - but this one was softer. For some reason, I felt the leg room was a little tight. The crew, as usual, were great! It took us 9h01m to get to Thrissur from Shantinagar - about 8h41m from Madiwala. Considering the 22 minutes lost in the dinner break, the running time may be considered good. Overall a good journey! Charging Point: Available. Did not use. Will I take this service again? Its a good service & most importantly, suits our timings to the 'T'! 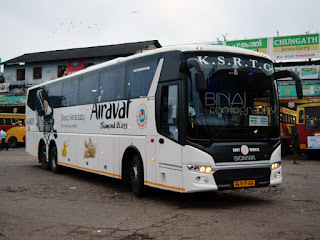 Scania's are airavat diamond class right?? Them y this was named so?? They were called Airavat "Diamond" class. 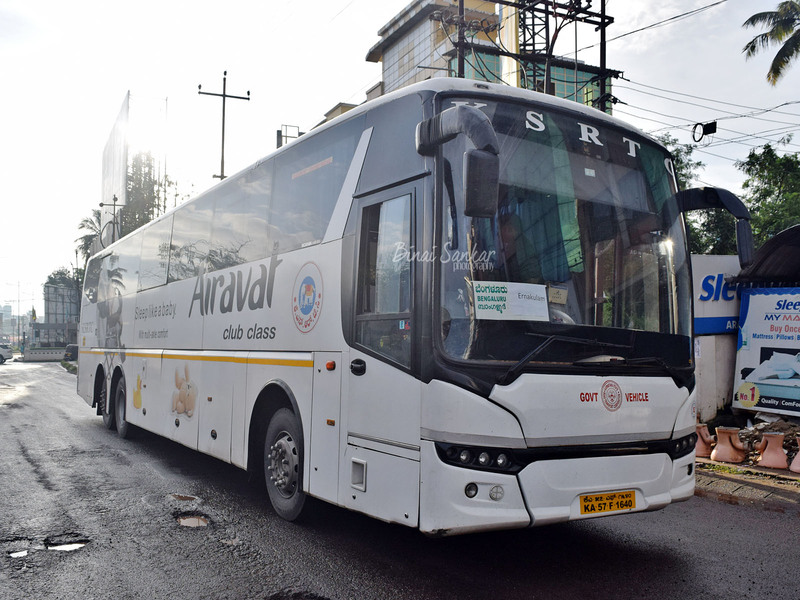 They've all be renamed as Airavat "Club" class now. This one if I remember correctly had a major accident sometime back. Infact one of the earliest Scania accidents. Changanassery to Bengaluru: Kerala Lines Scania!